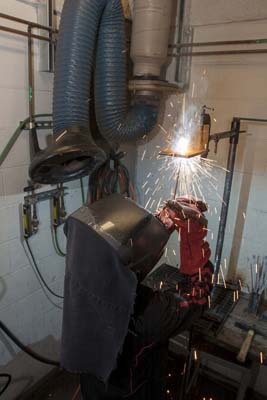 Interested in learning about welding but not ready to commit to a long, expensive program? Tidewater Community College’s Center for Workforce Solutions will offer an accelerated welding course beginning April 25. Students will be introduced to the welding trade and prepared for American Welding Society (AWS) certification during the 60-hour Shielded Metal Arc Welding course. Certification testing is included in the five-week training. The hands-on class, with 95 percent of class time dedicated to actual stick welding, has evening hours to accommodate working adults. Sessions are four hours in length and will be held Tuesday, Wednesday and Thursday nights beginning at 5 p.m. All classes will be held at TCC’s Workforce Welding Facility at 727 Mount Vernon Ave., in Portsmouth. The course concludes on May 25. The program is available at a reduced cost for those who qualify for the Workforce Credential Grant. Eligible Virginia residents pay $299, one-third of the cost of the class, based on the successful completion of the course. That fee includes the cost of personal protective equipment and the AWS exam fee. Students who do not qualify for the Workforce Credential Grant pay $897. Register online by April 24 at workforce.tcc.edu/register. When you register, you will be asked a series of questions to determine whether you qualify for the Workforce Credential Grant. For additional information, call 757-822-1087.